Magical moment by the stream, if I were a duck this would be my paradise! 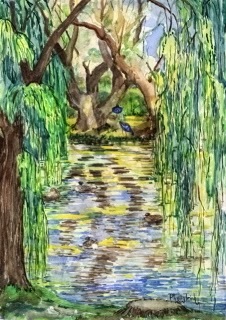 The drooping branches and hanging slender leaves old willow trees along the stream form magnificent curtains. The trees created structures of a fairy tale palace. Add to these were the reflective light bouncing of the water... floating on the water were some sleepy ducks .. further away were a few blue birds! time flew my mind flew too.. when I finished and show the painting to the group. It was a pleasant surprise! Everybody like it too but I did not say I was dreaming to be a duck! with yellow and blue I thought of Monsieur Van Gogh too!